Coconut Oils: Making the Right Choice | Nascent Naturals Inc.
A great resurgence of interest in coconut oil has begun. This is very encouraging as it may be one of the best oils to use both internally and externally. It was a staple for many years in our diets worldwide until the seed oil industry took over in the early 60’s and began imposing hydrogenated vegetable oils such as canola, corn and soya into our food and skincare products. Sadly, many things have changed, and not for the better as a result. There is a lot of information about the healing benefits of coconut, but not about choosing the right one. Common questions posed to me all the time are; what type of coconut oil should I purchase? And, what is the difference between grades? Alas, not all coconut oils are equal. Deciding factors to consider are; method of extraction, grade and intended use. The issue of organic coconut will also be addressed later in the article. 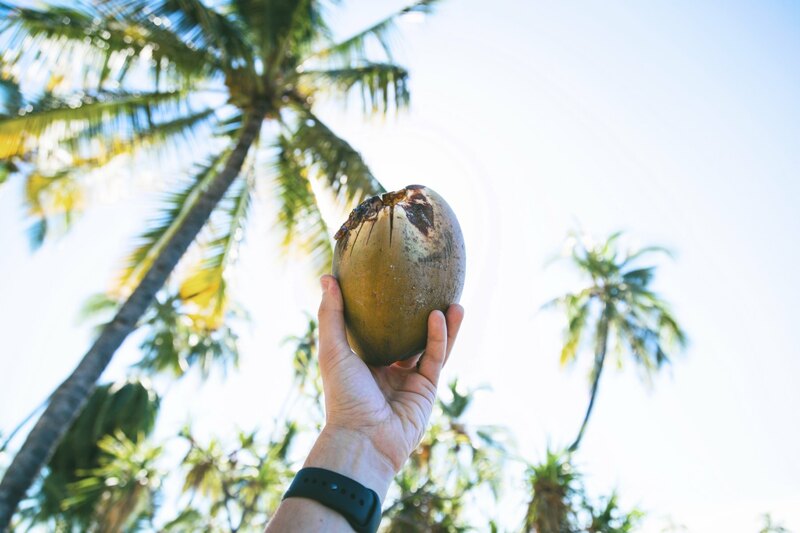 Following is a brief description of coconut extraction and processing methods, and the basic grades available on the market which are virgin, RBD, cold pressed and fractionated. A lot of misconceptions exist about how coconut oil is extracted. So much has changed with the technology even in the past 20 years, as demands for this oil steadily increase. Actually, there are several ways, which span the use of solvents, heat, dry and wet methods, natural, labor intensive and mechanical processes. All of them produce different grades or fractions and a wide range of qualities, prices and applications to satisfy many industries. Following is a description of these methods. Standard: Most widely used to process the bulk of the world supply in coconut oils for over 100 years. It involves solvents, enzymes, heat or a combination. The pulp of the entire inner coconut, referred to as “Copra”, is dried under the sun, in a kiln or smoke dried for several days to allow for water content to evaporate. Some small operations will use the sun to dry, which can result in pollutants, insects or rodents tainting the raw material with aflotoxins. Most commercial operations use kilns to avoid this problem. Dried copra is then pressed to squeeze out a crude industrial grade coconut oil. Its appearance is a beige slurry which is solid at room temps and strong coconut aroma. Consumers rarely see this type of oil as it is destined for manufacturing applications and mass food production including farm and pet food. Inferior quality and damaged coconuts are used as the starting point to produce this oil. This industrial grade can be refined into RBD or 76. RBD is an acronym for Refined, Bleached and Deodorized. The other term “76” indicates the melting point of solid to liquid which begins at 76 ° F. To achieve this, it can now be processed two different ways. The oil can be treated with high temperatures up to 200°F and solvents or enzymes to separate the carbon chains and proteins which give it an obvious coconut aroma and typical beige colour. This leaves white, crystalline solid oil which has little to no aroma. Coconut RBD extracted this way tends to be inexpensive because of the high yield, however it may be poor quality and partially hydrogenated with solvent residue. Newer technology to process RBD oil starts with premium quality coconuts, using only heat at lower temperatures, incorporated with centrifuge machinery. The result is superior quality and solvent free with no hydrogenation. The lower yield, extra time and labour, translates to higher prices and likely marketed as a premium product or expeller pressed. Traditional or ‘Village” Methods: Only the fresh white pulp of the coconut is minced and pressed to obtain an emulsion. Oil is then extracted either by decantation or heating which separates or removes water content. The oil obtained is fresh, pure and free of toxins. The heating process may destroy some components of the oil including vitamin E (tocopherols) which are needed for stability and protection against rancidity. Decantation takes time and skill to allow the fatty acids to separate from the water content. Both are labor intensive and with lower yields than standard procedure. This method can be used to extract virgin, cold pressed or as the first step of refining premium quality RBD oil and its derivatives. Wet Milling Process: This is a more recent technology designed to produce fresh pure oil on a large scale while preserving all natural components. This method extracts oil by mechanical means only; without high temperature, chemical, or enzymatic treatment. Some low heating, pressure and centrifuge processes are combined to make it a truly natural process, as the physical or chemical characteristics of the coconut oil is not altered in any way. This method has proven to be the best for extracting a high quality, unrefined premium virgin oil. Oils extracted this way will be much more expensive, but are the purest available. Coconut oils are known universally to be very skin friendly. Their fatty acid composition is mild and complimentary to the chemistry within our own skin. While there have been documented cases of sensitivities, they are very rare. Coconut oils lack the unsaturated fats and proteins typically responsible for allergic reactions found in other oils. Not prone to rancidity which causes free radicals to form in seed and nut oils, they are considered to be the most stable of all edible oils with a long shelf life. So now that we have a better understanding of how the oil is extracted, let’s examine the most common commercial grades to see which one best suits consumer needs. This is the most heavily produced and least expensive coconut oil. It also has the widest discrepancy in production methods. Because it is refined, bleached and deodorized, there are some assumptions that this oil is processed with solvents. While this is true of many manufacturers, premium quality grades which are expeller pressed without solvents are readily available. They will be more expensive to purchase in bulk or wholesale. This oil is excellent for cooking, especially when a coconut aroma or taste is not desired. The oil will survive high heat and not prone to rancidity. For those who ingest coconut oil for therapeutic reasons, but do not want the strong coconut taste, this oil is a good choice. Be sure that your supply was not solvent extracted. It serves as a stable, inexpensive filler oil in the manufacture of creams, lotions, ointments and body butters as it will not go rancid or oxidize other ingredients. This extends shelf life of the product. It will also survive the heat of production. A favorite choice for soap makers. It’s inexpensive, has good saponification properties and adds hardness to soap bars when cool. When directly applied to the skin, it provides emollient and softening properties. Also used as a pomade for the hair and relief for itchy scalp conditions. The need to liquefy by gently warming before use is a barrier for some purposes especially when blending with essential oils, or using in a massage mixture. However once essential oils or other carriers are mixed and temperature is below 76, it will become solid and retain aromas. Considered a heavier oil with potential comedogenic (pore blocking) properties for some skin types. This can be alleviated by reducing the amount used. This oil is a clear liquid above room temperatures, and white solid crystalline below, with a strong aroma characteristic of coconut. The composition of significant fatty acids makes it one of the most stable carrier oils. Not prone to rancidity with long shelf life and high OSI rating. In texture and viscosity it is one of the lightest oils on the market. Although it will go solid below room temperature, it is lighter than fractionated coconut oil and melts quickly upon touching the skin. Shelf life is longer than refined coconut oil and much longer than solvent pressed oil since the natural vitamin E is not destroyed during extraction. To be considered true virgin coconut oil, it must be extracted via wet milling process, which is designed to produce fresh pure oil on a large scale while preserving all components inherent in natural coconut oil such as squalenes, sterols, vitamin E and other antioxidants. This oil is a premium product which captures all of the healthy properties of the coconut. This oil is excellent for any applications for which RBD is recommended. Some considerations are: It does have an obvious coconut taste and aroma so a great choice in food and internal applications where this is not an issue or an intended enhancement. Regarding cosmetic and topical applications, the same issue of aroma may interfere with finished product especially if a specific aroma is required. However, this is superior oil which will enhance any formula. Best reserved for high end and premium products such as face, eye creams and cleansing milks. Resistant to heat, and provides stable anti-oxidant properties on its own or when added to products. As mentioned, the obvious aroma and taste. It will need to be gently heated till liquid for any applications. This is the most expensive oil of the coconut family but the results make it well worth the price. ** Do not be fooled by companies advertising “extra” virgin coconut oil. There is no such thing! It is virgin (first pressing) or it is not. This grade was created to satisfy the needs of the pharmaceutical and high end cosmetic industry. The shorter and long carbon chains which provide aroma and solid composition below room temperature have been removed. The result is oil that is almost all C8, caprylic, and C -IO, capric fatty acids and glycerin esters. These are medium chain fatty acids and triglycerides used in therapeutic dietary fats for weight loss products, medicines and as light, non comedogenic oil in cosmetics. This oil stays liquid at temperature down to – 20 F, is clear and has no aroma or taste. It is highly stable and will not go rancid or oxidize other ingredients such as essential oils or fine botanicals. Prices vary in the market due to extraction methods. The general rule; the cheaper the price, the more likely it was extracted with solvents. Non solvent extraction always costs more. A highly stable oil which has indefinite shelf life. Sometimes referred to as “nature’s baby oil” it is a light, neutral oil which absorbs quickly, without a greasy feel and becomes partly water soluble making an excellent choice as a bath oil. A great base oil for personal perfumes, bath or massage oils, especially when adding essential oils. It will not oxidize mixtures so extended shelf life is provided to more natural products. Excellent ingredient for high end face and eye creams as it is light and absorbs easily. Good neutral cooking oil with no odor and stable at high temperatures. May not be as nutritious as whole coconut oil. Not useful for anhydrous or low water applications such as ointments, salves or body butters. Because coconut oils are over 90% saturated fat, they are unfairly lumped in with the bad reputation of other saturated fats such as lard and margarine which are manufactured. If you believe this, here are a few things to ponder. These saturated fats now deemed to be harmful are “man-made”. Most seed and vegetable oils are comprised of long chain fatty acids. When you combined these with hydrogen atoms and heat, voila! You have solid rancid oil which is now linked to high cholesterol, heart disease, Alzheimer’s etc. All of these health problems have skyrocketed since these oils were introduced to the food chain over 50 years ago. Hard to believe that these oils were originally developed to have extended shelf life and low expense without any consideration for nutrition. On the other hand, coconut oil is comprised of over 90% naturally occurring short and medium chain saturated fats. This allows for easy digestion as these fats are metabolized directly by the body without passing through the carnitine transport system. Therefore, fats are not deposited in the arteries, and provide antioxidant support which boosts metabolism. Further research shows that serum cholesterol levels are not raised either. There is a plethora of studies on cultures which have coconut rich diets. There seems to be low to non-existent rates of cardiovascular disease, dementia, obesity and diabetes compared to North America. Chew the fat on that for a while. When purchasing coconut oils, you may want to avoid large chain and boxed stores as profits are usually placed ahead of quality. You may still end up paying a top retail price for lower quality. Labelling is usually quite vague so unless you open the container, you also may not be able to tell which grade it is. I find that fractionated coconut is rarely available in stores. Smaller bulk suppliers with experience, knowledge and quality sources will be the most helpful. You may have to purchase larger sizes, but you may find so many uses, that it won’t matter. Pricing will probably be much better. Besides, the stuff has a very long shelf life so storage is not a problem. With regard to coconut crops and organics, there are a few variables to consider. First of all, growing coconuts is quite different from conventional food farming and has little or no use for pesticides and herbicides. Most coconut groves are owned by networks of small, to large family owned farms or companies. When ready for harvest, coconuts are sold to processing plants. These trees produce coconuts year after year with little to no predators and do not require nutrient replacement. In some of the largest coconut producing areas of the world like Philippines and Malaysia, using pesticides serves no purpose or benefit, and would actually add unnecessary expenses for farmers. It is simply unheard of as it is a form of natural farming which qualifies as organic. As one coconut producer I once spoke to said, “To have one of these certifying agencies come in and document the obvious, would cost a lot of money which has to be passed on to our customers. We are not prepared to do that”. Another issue is the fact that Organic certification does not decipher between solvent extracted, copra coconut and natural. Therefore, certification is not an indication of quality. So you could end up paying higher prices for a certified organic, solvent extracted oil, or lower prices for a naturally refined non certified organic oil, when both are grown to organic standards anyways. The choice is yours. 2. Virgin Coconut Oil Manual for Micro and Village Scale Processing. 2006. 6. Many thanks to my coconut oil brokers and growers over the past 20 years who have provided ongoing education to me so that I may pass it on.